Anatalia Villaranda and Missy Robertson from Team Alicia performs ‘Tightrope’ on The Voice Season 12 Battle Rounds, Monday, March 20, 2017. “Anatalia you are so fun to watch. Missy I think you are talented,” said Gwen Stefani. “This is a two-hour concert in 2 minutes. Everything was amazing,” said Adam Levine. “That performance that you delivered is Grammy worthy,” said Blake Shelton. “Anatalia has a lot of energy. Missy has a beautiful and powerful voice,” said Alicia Keys. The winner of this battle is Anatalia Villaranda. Watch their performance on the video below. 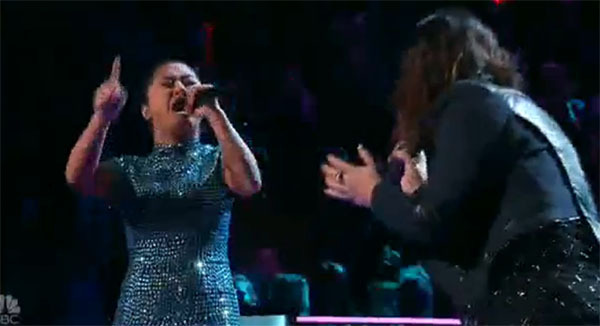 What can you say about Anatalia Villaranda and Missy Robertson’s performance? Share your comments below.